In global recognition of how zoos can be significant for species conservation, in October 2016, the Durrell Wildlife Conservation Trust (DWCT) became involved with two major International Conservation Awards. On Thursday 13 October, Durrell’s Chief Executive, Dr Lesley Dickie attended the 71st annual meeting of the World Association of Zoos and Aqariums held in Puebla, Mexico, and collected on behalf of the Trust the ‘WAZA Conservation Award’. And two days later, on Saturday 15 October, Durrell’s Chief Scientist, Dr Carl Jones, was honoured at a dinner held in Indianapolis by being the recipient of the ‘2016 Indianapolis Prize’. Such an award was in recognition of Dr Jones’ outstanding achievements in helping to save animal species from extinction, including the Mauritius kestrel, the pink pigeon and the echo parakeet. DWCT’s Honorary Director, Dr Lee Durrell, was delighted about both of these global honours and said: ‘I am overjoyed with the news that the Trust has won the WAZA Award, and so proud that we are the award’s first ever recipient. For it validates the efforts begun by Gerald Durrell so long ago to prove that zoos could become agents of species survival, and his firm belief that all zoos should strive towards this goal’. With memory, with love, with any strong emotion, there often come many-sided truths. 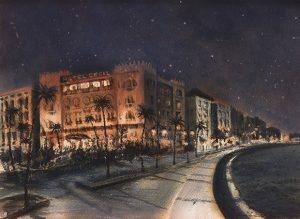 The Alexandria Quartet, Lawrence Durrell’s experimental tetralogy of mystery, love, and espionage, explores memory and knowledge, contrasting in its story the love affair of a young writer with the recollections of other people. Anglo-Irish novelist, poet, translator, travel writer, and dramatist Lawrence Durrell (1912–1990) set the tale in Alexandria, Egypt, in the years before, during, and after World War II. 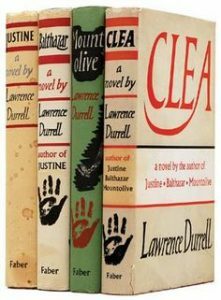 The four volumes, Justine, Balthazar, Mountolive, and Clea, involve the same characters, but each narrator tells the novels’ complex saga from his or her own perspective and place in time—“stereoscopic narrative,” in the words of Durrell. What is the relationship between memory, place, and time? How should we define truth and knowledge? Does Durrell’s narrative approach better capture how we make different meanings from shared events? We’ll explore these questions and many more against the backdrop of a lushly written portrait of an ancient city. When can we trust what we believe? The Alexandria Quartet is a literary embodiment of this year’s Toronto Pursuits theme “What can we know?” We are given four beautifully crafted novels of the same sequence of events; the first three run simultaneously and the fourth is set six years later. Various narrators people this “modern investigation of love,” each with his or her own point of view. Author Lawrence Durrell says in the introduction to the quartet that he intended the first three novels (Justine, Balthazar, and Mountolive) to be siblings, not sequels. They cover the three dimensions of space: different perspectives but all present at once. The fourth novel (Clea) “unleashes the time dimension” on the events described in its predecessors. As I worked my way through these novels, I was lost in the city of Alexandria, in the characters, in the exploration of love, in the varying perspectives of experience, in time itself. I was, in all senses of the word lost – at times perplexed, at times immersed and enraptured. I was reading a song. As I think Durrell intended, each novel provided a different movement of the quartet. Recounted through differing points of view, the events of a scene were like chords or melodies across—endlessly reinterpreted and set in a new context. I came to understand Durrell’s description of reality as a prism and began to question my own reality and what I know to be true. Is truth simply the whole that forms when multiple viewpoints or inputs come together? Eye of the Beholder will reflect on how and when we can trust what we believe in relation to the concepts of time, place, memory, reality and perspective. 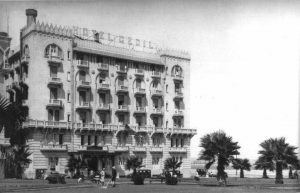 Join me, and let’s explore this lushly written portrait of Alexandria.